Met up with Bob Pelkey at Little Estero Lagoon on Ft Myers Beach with the idea of finding a snowy plover or any northern gannets. I was aware that gannets were seen off of Captiva Island a couple of days ago. But there presence then may have been due to a weather front pushing them close to shore at that time. The most common sight today was actually the large crowd of snowbirds enjoying a beach. We did find a couple of dozen Wilson's Plover, plus a few Semipalmated Plovers and a couple of Piping Plover. A few Dunlins were seen and one was starting to show the dark belly. The many Black-bellied Plovers were also starting to start changing plumage. We also found a couple Double-crested Cormorants sporting the name-sake crests. Had hoped to find any early least terns, the gannets, frigatebirds and the snow plovers, but struck-out on all of them. Only a few Laughing Gulls and Brown Pelicans , a lone Ring-billed Gull, a lone Royal Tern and a juvenile Herring Gull were seen. Otherwise the sky was empty. It was still good birding and Bob captured a lot of good photo opportunities including the Peregrine Falcon at rest high up the side of one the condos bordering the preserve. It may have been standing over a recent victim as well. It was too far for me to get a decent picture, but Bob should have a few good shots on his blog later this week. With a falling tide there had to be thousands of birds on hand feeding in preparation for some very long flights to the Alaska and Canadian North. Noticed that some of the birds are already molting into their breeding colors like Piping and Semipalmated Plovers, about half of the Sanderlings and some of the Red Knots and Black-bellied Plovers are starting to change. Did notice that the Dunlins and Short-billed Dowitchers were sporting their winter feathers still. Looked for the long-billed curlew, but it wasn't around at the time. But finally spotting an American Oystercatcher and a hand-full of Red Knots after not seeing them here for several months. Won't be too long and the least terns will be back to replace our winter birds as they migrate. Also have Marbled Godwits, Willets, Western Sandpipers and Forster's Terns on hand. I arrived just past sun-rise and expected to miss the Red-Cockaded Woodpeckers as they exit there nest holes. I did hear a couple of calling Bachman's Sparrows in the pines after I had passed the gun range, and as I appreached the the RCW colony on Oilwell Grade I could see that I was not the first ones here today. Met a very nice couple from up-state New York, who already had one of the woodpeckers in their scope. But the other two woodpeckers found here did not exit their holes till ten minutes later. It was very nice to have hit on two of the three special species seen at Babcock so quickly. But it was too not long of a wait for the Brown-headed Nuthatch as I had one sighted in the same locality shortly, while sorting through a mixed flock of Palm, Pine and Yellow-rumped Warblers. As we were watching the woodpeckers another couple, Leslie Starr and Joe Turner from Maryland arrived. I offered suggestions on where to find the Bachman's Sparrows and later on I reconnected with them as they were scoping on a singing male bachman. Joe was able to offer the a couple of his better photos of the sparrows for posting on this blog. Leslie is quite a birder. As of this posting she has 323 birds for the year and is sitting #10 on the ebird list for the United States. I was able to add most of my expected birds for Babcock-Webb totaling 41 species - Pied-billed Grebe, Wood Stork, Double-crested Cormorant, Great Blue Heron, Great Egret, Snowy Egret, Little Blue Heron, Tri-colored Heron, White Ibis, Swsallow-tailed Kite, Turkey Vulture, Common gallinule, American Coot, Sandhill Crane, Eurasian Collared-Dove, Mourning Dove, Common Ground-Dove, Belted Kingfisher, Red-bellied Woodpecker, Yellow-bellied Sapsucker, Downy Woodpecker, Northern Flicker, Great Crested Flycatcher, Blue Jay, Tree Swallow, House Wren, Eastern Bluebird, Gray Catbird, Northern Mockingbird, Brown Thrasher, Eastern Towhee, Northern Cardinal, Red-winged Blackbird, Common Grackle, Boat-tailed Grackle and Brown-headed Cowbird. The water level seems to be falling at Harn's Marsh and more wading and shore birds were found. Had a single Black-necked Stilt, some Yellowlegs in breeding colors, Western Sandpipers and Killdeers. The duck population is greatly diminished with absence of ring-necked and lesser scaup. Plenty of Blue-winged Teal still and plenty of Mottled Ducks. Was surprised to find a pair of male Wood Ducks. I don't recall seeing wood ducks here before. The American Coot population remains very large and Common Gallinules are still common. Limpkins and Snail Kites still have a strong presence. Did find that Northern Harrier and American Kestrel are still here, but for the past several days I noticed an absence of the tree swallows that had been so numerous this winter. 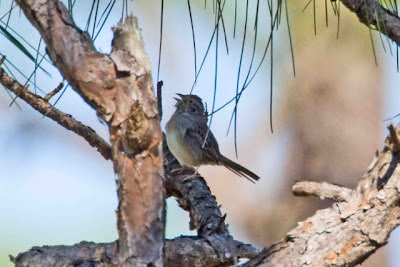 A few Palm Warblers and Savannah Sparrows were found today also. My daughter, Katie and I headed to Hendry County to look for Scissor-tailed Flycatchers and Western Kingbirds before they moved migrated back westward. Swallow-tailed Kites have returned to Florida and I have seen several carrying nesting materials. Today several were seen during our travels. Had three Crested Caracara today as well. Other raptors seen included Red-shouldered Hawks, Red-tailed Hawks, several American Kestrels, a couple of Northern Harriers and a Bald Eagle. Was hoping for a white-tailed kite but not seen today. We did successed in locating four Western Kingbirds and a lone Scissor-tailed Flycatcher in the expected location along County Road 835 near Deer Fence Canal Road. Other interesting sightings included Wild Turkey and a farm pond with a concentration of at least forty-five Greater Yellowlegs, plus three Lesser Yellowlegs, three Long-billed Dowitchers and four Cattle Egrets. Next headed up to Clewiston to look for bronzed cowbirds. At the boat ramp park we found lots of Laughing Gulls, Ring-billed Gulls, American Coots, DC Cormorants, Rock Pigeons, Grackles, Brownheaded Cowbirds and a pair of Bronzed Cowbirds. 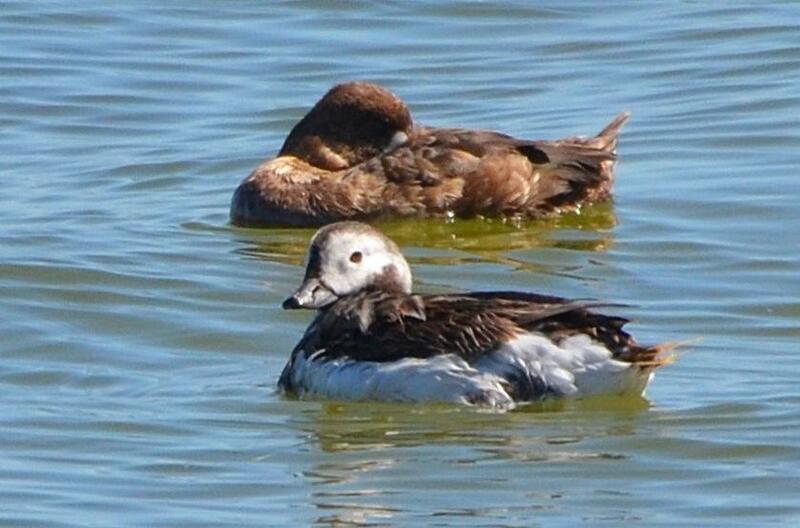 Vince McGrath returned to the Courtney Campbell Causeway this week to relocated the long-tailed duck. He was accompanied by Stan Damon, Ed Becker and Dr Jose Padilla-Lopez who took this photograph. The duck was only a few feet off shore in the company of a Lesser Scaup. Recently visited Harne's Marsh and counted at least a dozen, probably more, Snail Kites in the western section of the marsh. Had stopped by to see if the american wigeons were still present. The Blue-winged Teals, Moorhens, Coots and Mottled Ducks were numerous, but no wideons. Lots of Glossy Ibis and some White Ibis were present. As were all the other expected wading birds. Last Tuesday I made a quick stop at Bunche Beach to try to locate a couple of species that I had dipped on so far this month. The predominate species seen were Short-billed dowitchers, Dunlins, Least Sandpipers and Black Skimmers. On my visit to Bunche Beach I was able to photograph this very small crab, but don't know what kind of crab this is. Any ideas???? Leap Day was spent on a very good birding day trip. 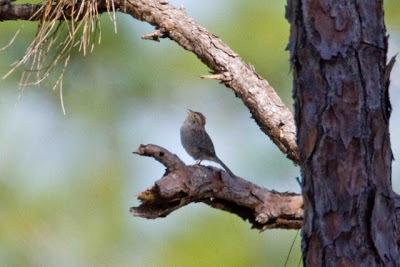 Joined up with Master Birder, Vince McGrath and headed up to Myaka River State park south of Sarasota. Started with a Peregrine Falcon along the highway close to the park. Within Myaka River State Park we quickly had Cedar Waxwings, American Robins, Tufted Titmice, Yellow-rumped Warblers and Northern Parulas. At the boardwalk we ran into John Whitehead and several other birders who already had our target bird in thier scopes. It was a female Yellow-headed Blackbird in the company of a large flock of female Red-winged Blackbirds. Other species found at the boardwalk included a very 'classic' Mallard, a Redhead, Lesser Scaups, Blue-winged Teals, Long-billed Dowitchers, Least Sandpipers, Caspian Terns, Forster's Terns, Black-necked Stilts, Roseate Spoonbills, Black-bellied Whistling Ducks, Sandhill Cranes, Wild Turkeys, American Pipits, American Coots and Common Gallinules. From here Vince and I heded toward Courtney Campbell Causeway in Tampa Bay, but first we checked out the Founders Club ponds on Fruitville Road. Dipped on the common goldeneye, but did get Ring-necked duck, Lesser Scaup and Hooded Merganser. At Courtney Campbell Causeway we easily found the the reported female Long-tailed Duck, because of the directions found on Birdbrains. we also added Ring-billed and Laughing Gulls,Red-breasted Merganser, Common Loon, Horned Grebe, Brown Pelican, Ruddy Turnstone, Dunlin, Short-billed Dowitcher and Willet. From here went added a stop at the closeby Possum Branch Preserve. We did not see the green-tailed Towhee but did get one each of the Lincoln, Song, Savannah and Swamp Sparrows. Heading back to Ft Myers Vince directed us toward Venice Inlet to look for a Purple Sandpiper. The place was very crowded and we did not expect to locate the bird, but Vince managed to locate it sleeping on the rocks on the north jetty. Got to say that Vince McGrath is an exceptional birder and is now available as a professional Birding Guide in SW Florida. Recently my co-worker, Charles Franzese, took these photos at the Venice Rookery. Spent several hours friday morning exploring Merritt Island National Wildlife Refuge. Traveled the Blackpoint Wildlife Drive and Bio Lab Road. The mourning started out with a nice Peregrine Falcon perched rigt along the road. Quickly added Coots, Hooded Mergansers, Blue-wing Teal, American White Pelicans, Wilson's Snipe, both Yellowlegs and Reddish Egrets. The duck population offered Greater and Lesser Scaup, Green-winged Teal, Northern Pintails, Mottled Ducks and Northern Shovelers. Also could add a conga-line of American Avocets, at least 80, marching in line as they feed. Found several Roseate Spoonbills, Black-bellied Plovers, Dowitchers, Sanderlings, Ruddy Turnovers, Caspian Terns, Dunlin, Least Sandpipers, Forsters Terns, Royal Terns, Belted Kingfishers, and Killdeers. In the lagoon along Bio Lab Road I could add Common Loon, Horned grebe, a pair of male Buffleheads a a lone female Red-breasted Merganser. I had really hoped to encounter rails, but didn't see or hear any today. Also dipped on the American and Eurasian Wigeons. From Merritt Island I headed down to Joe Overstreet Road east of Kissimmee Chain of Lakes Park for a shot at finding a Whooping Crane. Florida's resident whooping crane population is part of an attempt to create a migratory and a non-migratory flocks apart from the wild birds that migrate between Texas and Canada. Dipped on the whoopers, but did find a few Sandhill Cranes, Wild Turkeys, Eastern Meadowlarks, Bald Eagles, Ring-billed Gulls, Glossy Ibis, Cattle Egrets and Fish Crows. from here the trip was ending and it was time to head for home. American Coot, Sandhill Crane, Black-bellied Plover, Killdeer, American Avocet, Greater Yellowlegs, Willet, Lesser Yellowlegs, Ruddy Turnstone, Sanderling, Least Sandpiper, Dunlin, Long-billed Dowitcher, Short-billed Dowitcher, Wilson's Snipe, Bonaparte's Gull, Laughing Gull, Ring-billed Gull, Herring Gull, Lesser Black-backed Gull, Glaucous Gull, Great Black-backed Gull, Caspian Tern, Forster's Tern, Royal Tern, Black Skimmer, Parasitic Jaeger, Rock Pigeon, Eurasian Collared-Dove, Mourning Dove, Great Horned Owl, Belted Kingfisher, Red-bellied Woodpecker, Yellow-bellied Sapsucker, Downy Woodpecker, Pileated Woodpecker, Eastern Phoebe, Say's Phoebe, Great Crested Flycatcher, Loggerhead Shrike, White-eyed Vireo, Blue Jay, American Crow, Fish Crow, Tree Swallow, Carolina Chickadee, Tufted Titmouse, House Wren, Blue-gray Gnatcatcher, Ruby-crowned Kinglet, Eastern Bluebird, American Robin, Gray Catbird, Northern Mockingbird, European Starling, Common Yellowthroat, Palm Warbler, Yellow-rumped Warbler, Eastern Towhee, Chipping Sparrow, Savannah Sparrow, Fox Sparrow, Swamp Sparrow, Northern Cardinal, Red-winged Blackbird, Eastern Meadowlark, Brewer's Blackbird, Boat-tailed Grackle, House Finch, House Sparrow.